Whittaker was placed on injured reserve Thursday after tearing his ACL during OTAs. Analysis: Whittaker suffered the injury earlier this week during a non-contact drill, and his season is over before it even started as a result. Whittaker appeared in just 12 games last season and only ended up carrying the ball seven times, and he was is line to see limited opportunities again in 2018. The Panthers' backfield is expected to be lead by Christian McCaffrey and newly-signed C.J. Anderson, with Cameron Artis-Payne likely seeing limited snaps as well. Whittaker finished with seven carries for 18 yards and five receptions (on six targets) for 47 yards and a touchdown in 12 games played this season. Whittaker rushed for three yards on his lone carry during Sunday's 31-24 win over Green Bay. Analysis: The carry snapped a three-game touchless streak for Whittaker and brings his yardage total since Week 4 to zero. 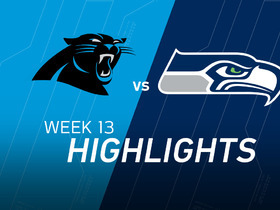 Rookie Christian McCaffrey continues to provide highlights while veteran back Jonathan Stewart keeps bringing power in between the tackles. Throw in one of the league's most mobile quarterbacks and there simply isn't much room for Whittaker to get much action week to week. 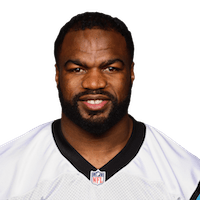 Panthers head coach Ron Rivera said Whittaker will be active Sunday against the Vikings and could earn carries in the contest, Joe Person of The Charlotte Observer reports. Whittaker is officially inactive for Monday night's game against the Dolphins. Analysis: Whittaker missed the last three games with a right high-ankle sprain, but he did not make an appearance on the injury report this week. 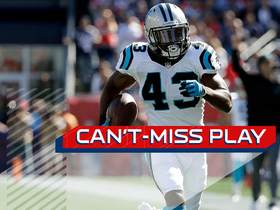 The good news is the 28-year-old appears fully recovered from the injury, but is still being held out in favor of Cameron Artis-Payne as the Panther's No. 3 running back. Neither running back should see significant or consistent offensive chances while Jonathan Stewart and Christian McCaffrey remain healthy. Whittaker (ankle) is listed as inactive Sunday versus the Falcons, David Newton of ESPN.com reports. Analysis: Although Jonathan Stewart logged one limited practice this week, the Panthers backfield is otherwise healthy, so the offense can withstand Whittaker missing a third consecutive contest. Per Jourdan Rodrigue of The Charlotte Observer, Whittaker has been recovering from a right high-ankle sprain, making the decision a prudent one. Expect Christian McCaffrey and Cameron Artis-Payne to handle any carries not given to starting running back Jonathan Stewart. Whittaker (ankle) is listed as questionable for Sunday's game against the Falcons, David Newton of ESPN.com reports. Analysis: Whittaker has missed the last two weeks with the right ankle injury, and though he was able to practice Thursday and Friday, it's unclear if he'll be healthy enough to contribute effectively by the time Sunday arrives. If active for the Week 9 contest, Whittaker would see the majority of his snaps on special teams. 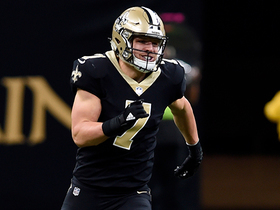 New Orleans Saints quarterback Taysom Hill gets his second tackle on kickoff. 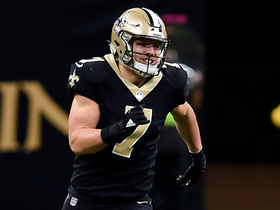 New Orleans Saints quarterback makes a nice tackle on kickoff. 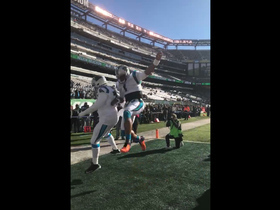 Carolina Panthers quarterback Cam Newtown hypes up his teammates before their Week 12 matchup against the New York Jets. 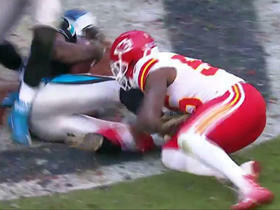 Carolina Panthers quarterback Cam Newton hits running back Fozzy Whitaker for a 28-yard TD. 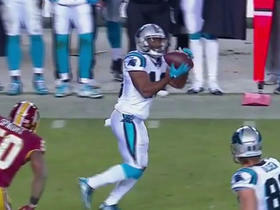 Carolina Panthers running back Fozzy Whittaker picks up big yardage on a 19-yard run. 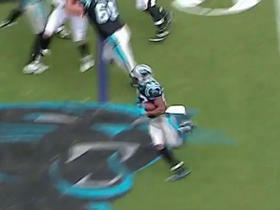 Carolina Panthers running back Fozzy Whittaker gains 25 yards on a short pass from QB Cam Newton. 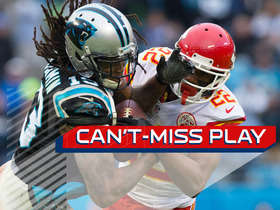 Kansas City Chiefs cornerback Marcus Peters strips the ball away from Carolina Panthers wide receiver Kelvin Benjamin in a game-changing play. Kansas City Chiefs linebacker Dee Ford goes through the line unblocked to stuff Fozzy Whittaker for a loss of yards. 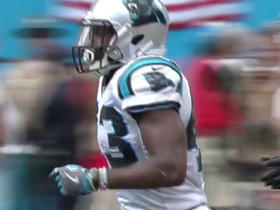 Carolina Panthers running back Fozzy Whittaker rushes for a 25-yard gain.